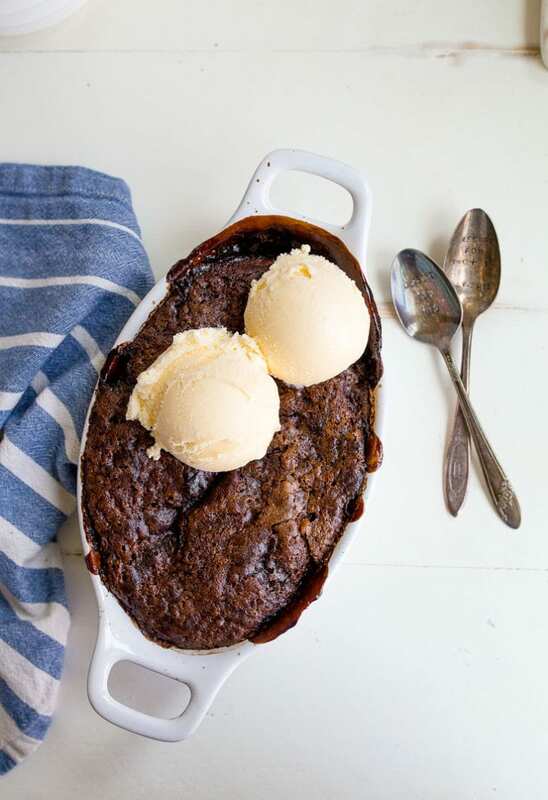 Chocolate cobbler recipe for two made in a small baking dish. 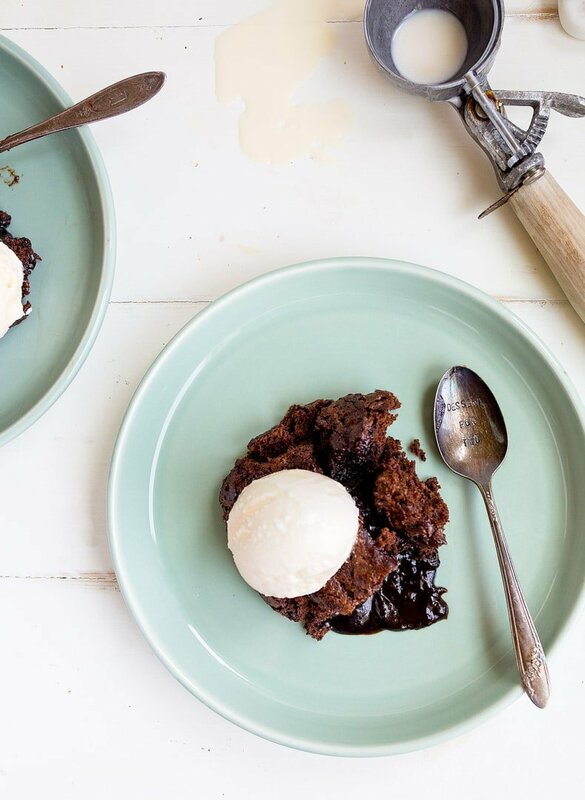 This Southern chocolate cobbler recipe is basically a brownie baked with hot fudge on the bottom. Also, this recipe is an updated version of the earlier chocolate cobbler on my site. I reduced the water by 1/4 cup and tested both Dutch-processed and regular cocoa powder and they’re both great here. I’ve heard this chocolate cobbler recipe called many things over the years: chocolate pudding cake, mud pie, brownie pie, brownie fudge bake, death by chocolate, and more. But mainly, I hear it referred to as ‘the best chocolate dessert ever.’ Which is 100% true. Essentially, it’s a brownie baked with hot fudge sauce, all in one pan! The method to make this Chocolate Cobbler feels very strange. It starts with a thick layer of brownie batter on the bottom of the baking dish, followed by a crumbled dry mixture on top. Boiling water is poured on top of both layers in the dish—it is never stirred. Resist the urge to stir the layers together, or you will not get a layer of fudge on the bottom with brownie on top! You will doubt me when you’re baking. You will think I’m crazy, but when it comes out of the oven, you will become a believer. At that point, you will praise me for helping you get brownies and hot fudge sauce in the same pan for such little effort! Chocolate cobbler relies on milk for moisture and fluff. I use the milk that I always have in my fridge: Horizon Organic Grass-fed 2% milk. 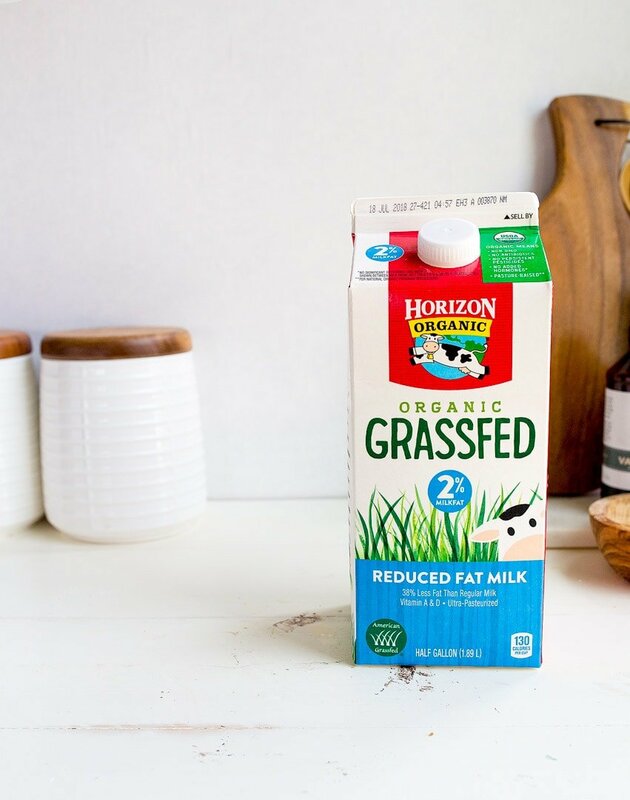 I’m a long-time believer in grass-fed dairy (it’s what our grandparents ate, by the way), and was thrilled when my favorite organic milk by Horizon became available in a grass-fed version! I appreciate companies that make the extra effort to make products that are better for our health and the environment. Grass-fed milk is higher in CLA (conjugated linoleic acid), which is one of the good fats that reduces heart disease and helps increase absorption of vitamins A and D in our bodies. I’ve bought Horizon Organic milk for years, and love its creamy richness. Fun side note: this recipe is entirely egg free, so if you’re out of eggs or avoiding eggs because of an egg allergy, you can enjoy this! I seem to have a lot of Mamas write writing to me and asking for more egg-free recipes for their kiddos once they discover my small batch of chocolate cupcakes are egg-free. I made you a video to show you exactly how to make this chocolate cobbler for two recipe, because I wanted you to see the weird baking method. It’s so hard to not to stir this before it heads to the oven, and I want you to see the texture of it. -The pan I use has a 0.6-quart (20-ounce) capacity. 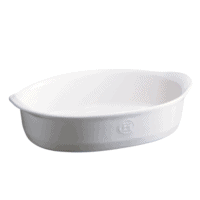 Fill your baking dish up with water to test the capacity—it should hold 2.5 cups of water to the top. This is a dish similar to what I’m using. 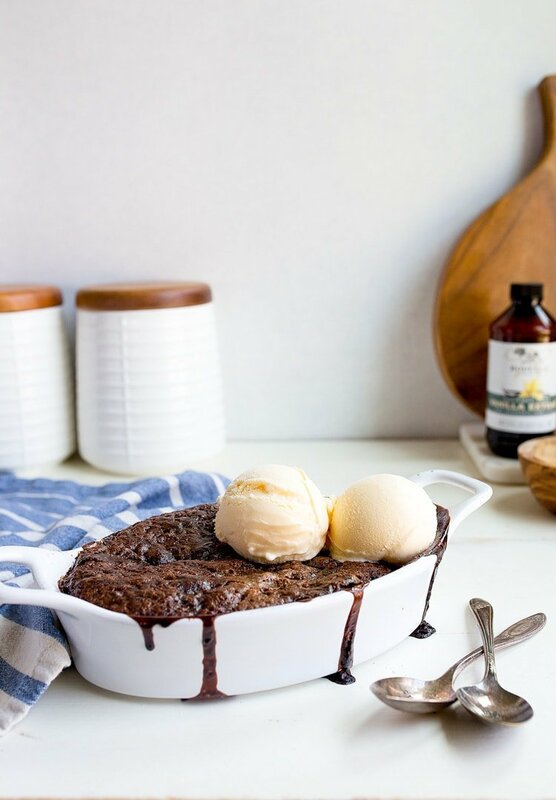 -Bake this chocolate cobbler on a sheet pan to catch drips from the hot fudge sauce bubbling up from underneath. -Let it cool for 15 minutes before scooping and serving with vanilla ice cream. -Yes, the recipe really doesn’t have any eggs! Southern chocolate cobbler recipe for two. Preheat the oven to 350 and have ready a 0.6L (about 20 ounces) small ceramic dish. First, make the brownie layer: In a small bowl, whisk together the flour, baking powder, salt, espresso powder (if using), and the cocoa powder. Stir in the milk, granulated sugar, melted butter and vanilla. The batter will be very thick. Spread it in an even layer in the baking dish. In a separate bowl, make the top layer: whisk together the cocoa powder, sugar and brown sugar. Sprinkle this over the brownie batter evenly. Pour the hot tap water on top of everything, but DO NOT STIR. Bake the cobbler on a small sheet pan to catch overflow for 35 minutes. Let stand 15 minutes before serving hot. can I double this recipe?????? Do not be fooled people. It looks like it won’t be nearly enough to satisfy two grown adults, but it’s sugar and chocolate and one batch is enough. Mine turned out soupy instead of pudding-y. Next time will try reducing the water. This would be a great thing to spice up; Make a mexican cocoa version. Holy mother of God. I’m making this while my husband is at work and then I’m going to hide in my closet and eat the whole. dang. thing. And I’m not going to feel guilty at all. Maybe I’ll share with him next time. Maybe! Oh, I’m so glad you came up with a smaller version of my favorite dessert. When I was growing up we always called it Chocolate Pudding cake. I never make it now, because I can so easily eat the whole pan, but wouldn’t feel so guilty eating two servings! Hurray! I love this dessert (we also call it Chocolate Pudding Cake). I’ve been making your recipe for Molten Chocolate Cakes when I have a chocolate craving, but I like that this doesn’t call for any egg. My mom used to make this all the time and I always thought the hot water step was strange – but you KNOW I didn’t care at all once it came out of the oven and shoveled it in my face! This looks so good!! And, I love your Fiestaware plate. This would be THE perfect dessert for Valentine’s Day, it looks amazing!! I have a fiance who I love but would have to make him his own one of these – I want the dessert for two for myself! Chocolate cobblers or chocolate lava cakes or whatever you want to call them are probably one of my favorite desserts of all-time. Seriously what could be better than eating melted chocolate and it being socially acceptable?? Nothing, that’s what! But this looks beyond amazing, I’ll definitely be making one for me, myself, and I for Valentine’s Day since I am one of those single-folk, but it will be worth every calorie :). Oh my LORD I’m gonna drown in this. Holy mother. It’s so dense and chocolatey and PERFECT! This looks sooooo good! I think you’ve solved my V Day pud dilema already! *sigh* I am going to be alone on Valentine’s Day. Not the best holiday when you’re single. But Christina, you’ve helped me see the silver lining. I’m going to make me a chocolate cobbler for two and eat it. All. by. my. self. Yes! 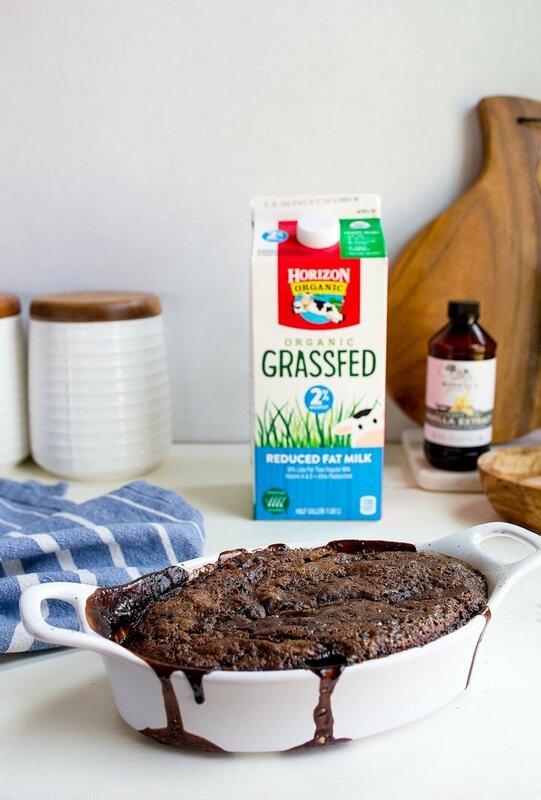 Seriously, so excited to try this – I looooove me some chocolate cobbler! Oh goodness! This looks to.die.for. And gorgeous napkin. I love the colors! A cross between brownies and chocolate pudding? SOLD! these sound great. i can’t believe Valentines Day is one month away! I love that you love Valentine’s Day. You are too cute! I have never ever had chocolate cobbler. I am not lying to you when I tell you that I am 100% making this for my husband for our dessert on V-Day! He was never much of a dessert person, but after we got married and I started the blog, he has been converted. I love that you love Valentine’s Day! I love it too and people always make fun of me. But I love celebrating love! I’m totally making this. But it will be dessert for one, because my husband doesn’t like chocolate. Weirdo. LOOOOOVE Chocolate Cobbler!! Happy month-til-valentines, sweet friend!! Soooo good! Saw it, made it & now eating it! looks sooooo good.. this looks more like a molten lava cake. yummy! mmmmmm. This looks so yummy! Just so happens that my husbands birthday is on Valentines day, so this will be a perfect romantic/birthday pudding! Woo hoo! 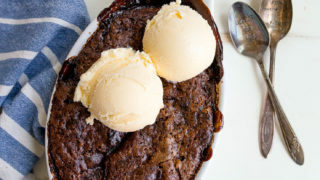 Chocolate cobbler sounds pretty incredible! I’ve been meaning to try something like this for awhile, but just haven’t yet. Oh wow, this dessert sounds insanely good. I don’t think I can wait until valentine’s day to try it! Perfect for a Valentines Day dessert! I want to dig right in! What a great idea! Would it be wrong if this was just for one? I mean me? Wow! The gooey chocolate pictures are making my mouth water. I’m printing this recipe right now and putting it in the “To Do” pile. Thanks! So I am going to be drooling ALL day thinking about this … I must have some! Looks amazing. Can this be baked ahead of time, say the night before serving? Or should it really be served soon after baking? Yep, this is going to be actioned for the hubs! He’s gonna go crazy! Ooooooh, Christina! My mother used to make this for dessert on Christmas (we called it Chocolate Pudding Cake, too), but she’s been on an apple crumble kick (not that there’s anything wrong with that!) for the last few years, so it’s nice to have a scaled down version of this recipe that I can make for my husband and I – for Valentine’s, or…um…anytime! Thank you for sharing! I love that you’re doing a month-long countdown! I just started thinking about my Valentine’s recipes today and need to get on them. I’ve never heard of chocolate cobbler before, but it looks fantastic!! I can’t wait to make this! Going to try it gluten free (probably use a mixture of brown rice and sweet white sorghum flours). Only problem is…I don’t think I will wait ’til Valentine’s day to make it :-) Thanks for sharing! Yesssss! I love chocolate cobbler and I love that not very many have had it. It’s like surprise, you never knew this existed and now your world will never be the same! Holy Chocolate! This looks incredible. I love how easy it is to make a cake and a sauce. My husband (a true chooclate fiend) is going to be giving me a big kiss on Valentines, that’s for sure! III LOOOVEEE CHOCOLATE COBBLER!!! MMMMMM. in. LOVE with this recipe! Yum, this sounds dangerously good! I love the gooey chocolatey goodness! I just made this for my boyfriend! We’ve just demolished it and now we are in a sugar coma! These Australian taste buds are not use to this decadent southern cooking! Yee haaa! Where do you buy a ceramic dish that small?!?! I can’t find one! You’ve got a minor error in your instructions. I made this for an at-home date night the other night with my husband, and based on your pictures, I used a small casserole dish. Your recipe said to use a dish with a 1 1/2 cup capacity, but I think you mean a 1 1/2 quart capacity. Big difference. I guessed right, and the dessert was aMAZing, but I didn’t know if you wanted to change it. Thanks! Thanks for writing. The recipe is correct: I baked it in a 1.5 cup mini baking dish to serve two. I’m baffled how you baked the same small amount of batter in a much larger baking dish. Did it fill the whole dish? Did you double the batter? After it baked, did it have any of the gooey, saucy part left? If I don’t have a ceramic dish the right size, would I be able to use a 6-inch cake tin instead? This was delicious, but your instructions say to use a baking pan with a 1 1/2 cup capacity. Mine had a 2 cup capacity and it was way too small! I barely put in 1/4 cup of water before it overflowed! I would suggest at least a 3 cup baking dish. Otherwise it was good, even with all the missing water. Thanks for the recipe! Enjoyed tonight with my boyfriend as an impromptu Valentine’s Day dessert. Baked in a 1.5 quart glass loaf pan with success. Thank you for the delicious recipe scaled for two! Okay, I followed this recipe to a T, used all new ingredients, the right sized baking dish, and my oven works fine. This came out soupy, and the only reason I’m giving it two stars is that the flavor was great and I served it over natural vanilla bean ice cream. My hubby thought it was a sauce and raved over it. Can’t imagine what was wrong here, no eggs maybe? So, it’s supposed to be soupy on the bottom. Only the very top layer sets. Did the whole thing not set for you? I’m searching through the other comments from people who made it successfully, and no one else had this problem :/ Bummer! I would check your oven temperature. It sounds like it did not bake long enough if the whole thing did not set. However, if the top layer set and the ‘soup’ was on the bottom–you did everything right! :) The recipe does not contain eggs on purpose. You are a rock star, my friend. I made this tonight and it’s pure chocolate heaven! Thanks for the awesome recipe. Umm hello recipe might be awesome but fit in a 1 1/2 cup baking dish?? No way! I had to split the batter into two ramekins. Not happy Jan!! I am so glad I am making this for a casual evening instead of for Valentine’s Day. As the recipe says, I used a small casserole that holds nearly 2 cups. It is not big enough for the ingredients, so I had to move the ingredients to a 1 quart casserole, messing up the layering. I expect it will still taste ok, but it was very frustrating and made a mess. Now that I look at it, the ingredients add up to more than 1.5 cups, even if you assume that the sugar will dissolve in the water. I wish I had read more of the reviews before attempting to make this dish. The recipe calls for a dish that has at least a 1 1/2 cup capacity, this is WRONG. 1 1/2 cups is no where near large enough and I ended up with a mess and a desert that was inedible. We were stuck home with a blizzard this weekend and I had a terrible craving for chocolate. This was the perfect fix for that!! Very easy and sooooooo yummy! I’ve tried several of your recipes and I’ve never been disappointed. Keep up the great work!! ???? Definitely going to try this! Question is the brown sugar, packed or not?? Packed! Sorry I didn’t mention it! I followed the directions exactly and ended up with 2.5 cups of batter [including both layers and the water]. I’m glad I used a 3-cup dish. What would be the best way to make this for a small dinner party? Can I assemble the two elements (I plan to double the recipe) and then add the hot water and slip into the oven as we sit down to eat? I want to be sure it’s warm when we eat it. 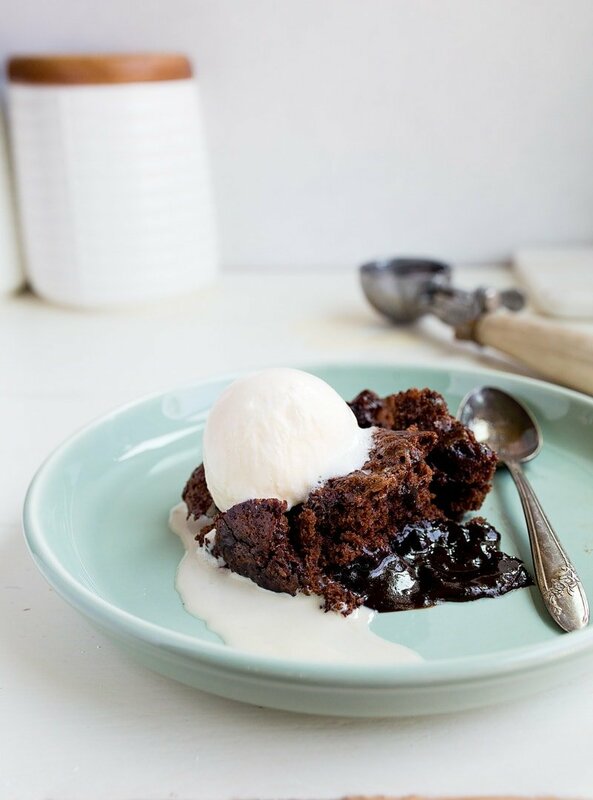 Hot Fudge Pudding Cake is one of my family’s most beloved recipes! My Grandma made if for my Mom’s first birthday, and My Mom has been making it for us for years and years! Pure comfort food! I love that you scaled it down, becuase this stuff is dangerous, and since it is not nearly as good leftover, the 3 of us usualy end up eating a whole cake in one or two days! Thank you from saving us from ourselves! This looks so sinfully decadent that I, too, may not share with my husband. The gooey ooziness of the fudge and then I’m just imaging the slow melt of the vanilla ice cream has me nearly speechless. Wow! Just baked this and it’s perfect! My ceramic dish is marked in ounces, and is the 20oz size you suggested. Once I had all three layers in, my 20oz (2.5C) was full to the brim with chocolatey deliciousness! I worry anyone trying to do this with a 1.5 cup capacity (which = 12 oz) might find themselves short on space! I especially love that this recipe is egg free – we used the last of our eggs at breakfast and this cobbler saved the day! Will definitely make again! We have devoured every Dessert for Two recipe we’ve tried so far! My mom made this frequently but it was called Fudge Batter Pudding. I pulled out her recipe and compared ingredients because I couldn’t figure out why yours was much lighter in color. Our recipe doesn’t use brown sugar and uses boiling water instead of hot tap. AND nuts! I love that name, Fudge Batter Pudding! It makes me drool! It might be the cocoa powder I used (Dutch process). I made this then lost the link so glad I found it again this is the only cobbler/lava cake I’ve made that actually had the saucey bottom. The ones you mix never turn out right for me. I also love that it doesn’t have eggs, I’ve picked up a sensitivity for eggs and really try to avoid them which can be harder then I thought. Eggs seem to be in everything. I’ve seen a “serves more” people version of this “inverts while it bakes” somewhere (maybe America’s Test Kitchen?) and I always wanted to try it but with just two of us in the house, it never made sense to do so. Now I have this–and I look very forward to trying it out once I pick up a properly-sized baking dish for it. Can this be made in two smaller dishes if you do not have the correct size ceramic dish? Or could a glass baking dish yield the same results? It might overflow. I would be better to double it and bake it in an 8×8 brownie dish, I think.